See this block? So pretty, right? I brought it to share with yall yesterday. But...I forgot my phone at home. :( Ever have one of those days that starts off with something as simple as that but then just goes downhill from there? Yes, that was yesterday. But it ended with my daughter and I having dinner out with a bit of retail therapy after. Perfect ending to a very....interesting...day. Anyway, meet Leo. 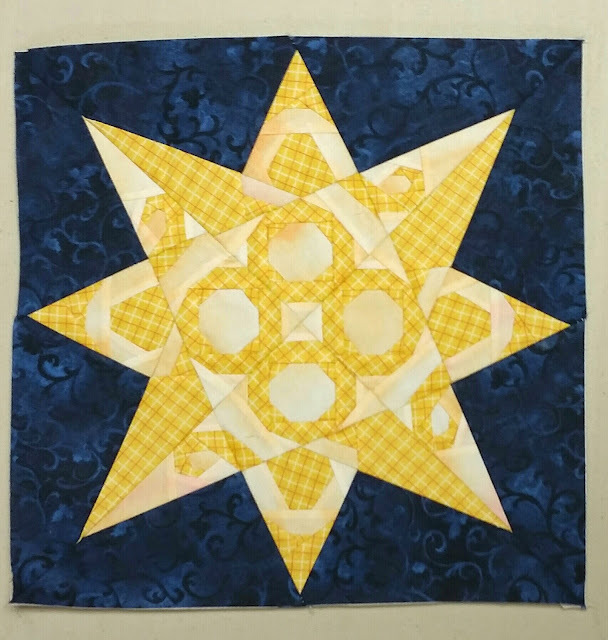 This is the latest block in my Zodiac Stars quilt. I love this one. It gave me a few issues, but overall, I love it. Here are the large stars together so far. Each so different but all so pretty. I am so loving this quilt! I printed up the Doctor Who patterns that we are mixing into this quilt. We are using the Tardis in the center (of course) and the corners will hold a sonic screwdriver, a fez and bow tie (my niece loved the 11th doctor), a weeping angel, and the doctors pocketwatch. I'm really excited to see this one come together. Today I'll be linking up with Needle and Thread Thursday at My Quilt Infatuation, and Let's Bee Social at Sew Fresh Quilts. 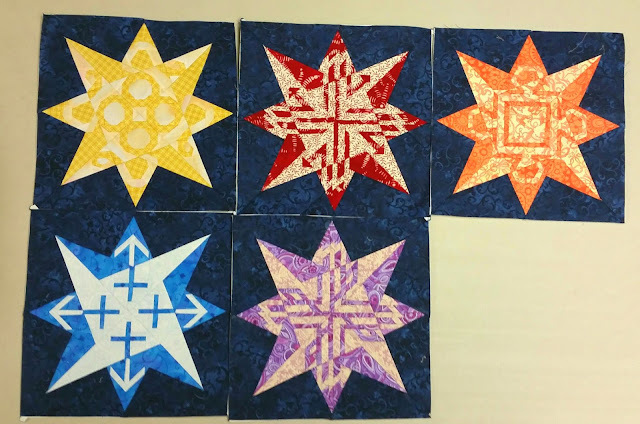 On Friday, I'm linking up with Fort Worth Fabric Studio for Fabric Frenzy, Paper Piecing Party at Quilt Art Designs, and Can I Get a Whoop Whoop at Confessions of a Fabric Addict. Those are very fancy stars! They look so complicated to piece. Mixed with Doctor Who, it is really going to be a fabulous quilt! I incorporated some Gallifreyan in my son's college quilt but I really need to make a full Doctor Who quilt at some point. Can't wait to see your quilt come together! Oh, my goodness, I love these stars! I don't know much about Doctor Who at all, but if that's what inspired this, boy, I need to do some catching up. This is going to be an incredible quilt! Leo is a perfect fit with the other stars. Your quilt just needed the yellow in Leo. Those stars are so intricate! I'm anxious to see what they look like with the Dr. Who elements added to the mix.